Get more information about these protections here. November 11, 2018 marks the 100th anniversary of the armistice which ended World War I–The Great War. Ceremonies commemorating this event have been taking place across the United States and in Europe. The Great War impacted nearly every community in the United States but has often been considered the “Forgotten War.” Today there are resources online which document many of the individual stories of the war. Links to the stories of Illinois families can be found on this page of the United States World War I Commission website. Mount Prospect was just over a year old on the Armistice Day in 1918, but Mount Prospect’s citizens felt the impact of the war as well. Relics of that time can be found at the Library’s Illinois Digital Archives page. Among them are a uniform jacket and a gas mask. After the war Mount Prospect veterans formed VFW Post 1337 and the American Legion Post 525. The names of the women who were charter members of the American Legion Auxiliary of Post 525 may be seen here. Veterans in both organizations continue to be active in the community today and do much to honor those who served in the past and do so now. Never forget. If you’re a small business owner or entrepreneur with a great idea, you may be looking for resources to help answer some of the many questions you most likely have. Well, the Mount Prospect Public library is here to help–with a little assistance from the Small Business Administration (SBA)! The SBA is the government agency tasked with providing information and programs dedicated to assisting small businesses, and one of the best is their yearly Small Business Resource Guide. Inside you’ll find info on everything from how to start a business and writing a business plan to programs designed to help veterans and native Americans, as well as funding sources. Just click above or HERE to get started, or grab a paper copy from the Business Resource Center behind the Research desk. And if you need help navigating this or other business resources available at the library, MPPL Business Reference Joe Collier is available for one-on-one reference appointments–just email or call the library to set one up! New States Added to WWII Draft Registration Cards! Fold3 has added new U.S. states to its collection of WWII Draft Registration Cards! The collection (via the National Archives) now also includes Alabama, Connecticut, Florida, Idaho, West Virginia, Utah, Alaska, Wyoming, and Virginia. The cards in this collection are registration cards for the draft and do not necessarily indicate that the individual served in the military. You can read more here. Veterans Day, originally known as Armistice Day, was first set as a U.S. legal holiday to recognize the end of World War I. This “armistice” took place on November 11, 1918. 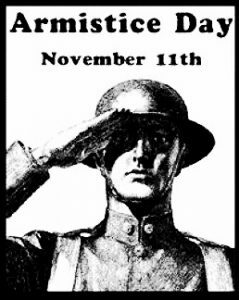 In 1938 legislation was past to formally dedicate November 11 to the “cause of world peace.” With the urging of veterans organizations, the U.S. Congress amended the Act of 1938, replacing “Armistice” with the word “Veterans.” On June 1, 1954, November 11 became a day to honor all American veterans. In 1968 Veterans Day was moved to the fourth Monday of October. This move was highly unpopular so in 1975 the annual observance of Veterans Day was moved again to November 11. A more complete history of this holiday can be found here at the website of the U.S. Department of Veterans Affairs. Many Mount Prospect natives have served in the military over the past 100 years. There are some artifacts of this service in the online collection Dimensions of Life in Mount Prospect. Among them are a World War I gas mask, a World War I uniform jacket and helmet, and the stole of a local World War II chaplain. On November 11 of this year, Mount Prospect will honor veterans in a free program to be held at Lions Park Recreation Center beginning at 10:30 AM.